Apple’s iPod was originally released in the year 2001 to primarily serve as an MP3 portable media player with the capacity to carry 1,000+ songs. Ever since its release till this present time, iPod has evolved to different series such as iPod Touch, iPod Classic, iPod Nano and iPod Shuffle. These series of iPod have different uses, features, and functionalities such as Touch-sensitivity, video camera, Bluetooth and Wi-Fi adapters, Safari browser, iTunes Store, App Store, Voice Control, FaceTime, Retina Display, Apple A4 chip, Siri, iSight cameras, M8 motion compressor, etc. 1. When you lose iTunes Library data to a system crash or failed hard drive. 2. When you lose your old PC to theft or robbery. 3. When you’re upgrading your computer to a new one. The best way to restore your iTunes library from your iOS 12 iPod to a new computer is by using a third-party software callediMyFone TunesMate. The beauty in using TunesMate to restore iTunes Library lies in the fact that it only requires one click to complete the iTunes library restore process. Therefore, you don’t need to struggle with iTunes restrictions, follow its limitless steps, or avoid its restrictions, just download and install TunesMate to have your iPod files well saved on your new PC. 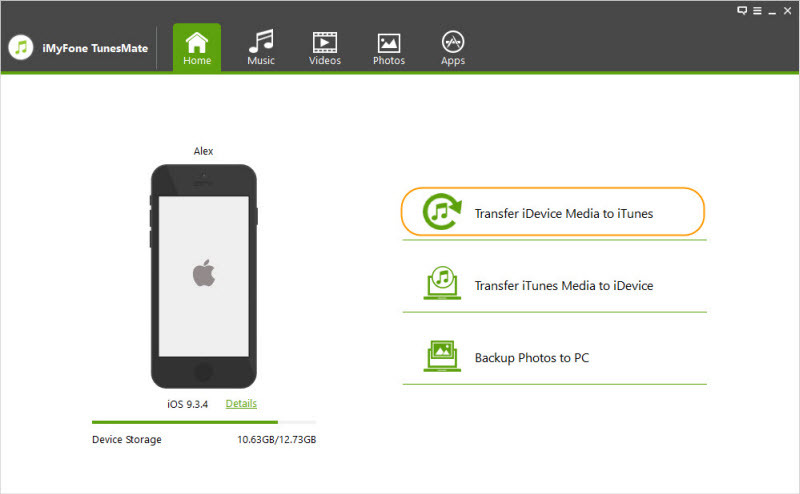 Offers 2-way transfer features for transferring files between iTunes/PC and iPod. 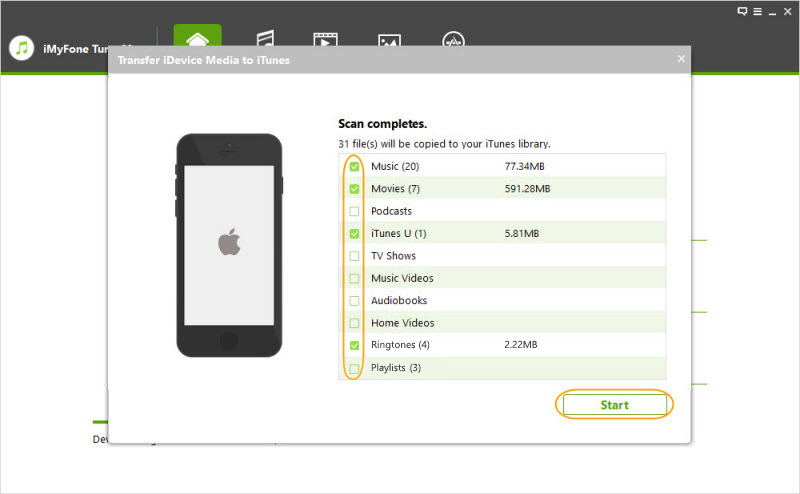 Transfer data from unlimited iTunes libraries to unlimited iOS devices. Restore iTunes library without Apple password. Offers media transfer support for purchased and non-purchased files. Preview through your iTunes library before restoring. Media files can be transferred without overwriting or deleting the original file. Steps to Restore iTunes Library from iPod to New Computer Using TunesMate. Step 1: Install and launch TunesMate on your computer.Then connect your iPod to your computer via a USB cable. Step 2: Select the function “Transfer iDevice Media to iTunes”. Click on “Start” button to scan your device. Step 3: Check the media files you want to restore, and click “Start” to restore them to your new computer. There are several methods for restoring iTunes library from iOS 12 iPod to a new computer, but we’ve chosen to discuss iTunes method of restoring iTunes library from iPod to a new Windows computer or Mac. Before we continue with the steps of restoring iTunes library from iPod, we would like you to note that if you’ve not authorized your new computer on iTunes, you may not be able to access your iPod media library on iTunes. On Mac: Go to the menu bar at the top of your computer screen to choose “Account > Authorizations > Authorize This Computer". On Windows PC: Go to the menu bar at the top of your computer screen to choose “Account > Authorizations > Authorize This Computer". If you don’t see the menu bar, press Control + B on your keyboard. Enter your Password and click “Authorize”. Download and install the latest version of iTunes on your new computer. Launch iTunes on your PC and connect your iPod to your PC using Apple’s original lightning cable. Your connected device will appear as an icon on the upper-left corner of iTunes windows. Click on your iPod icon, locate Summary on the left sidebar of the iTunes window. You can check the box next to the items you want to back up by clicking on them. You can also choose whether you want to back up your entire library or choose a file. Click “Apply” to back up the selected media files. Repeat step 4 to back up different types of media files on your iOS 12 iPod. Mac: Click desktop to make sure you’re in Finder. Then choose “Go > Home”, and double-click the Music folder. Windows: Navigate to “\Users\username\My Music\iTunes”. Disadvantages of Using iTunes to Restore iTunes Library. The method is complicated and full of limitations and restrictions. You can only transfer purchased files using this process. iTunes allows you to authorize only 5 computers or less. Non-purchased files will not be restored using iTunes.